So, what's it like to be next door to a construction site, say, on a Sunday when people are trying to go to church? 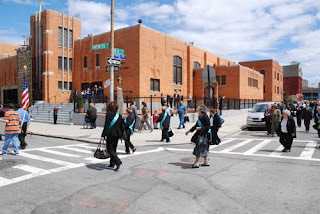 Ask the parishioners of Our Lady of Mount Carmel, the church on Havemeyer Street that is known to many people for the Giglio Feast that it sponsors every July. (For those haven't been, they lift a three-ton, five-story float with a marching band and carry it down the street in blazing summer heat.) They say they've barely been able to go to Mass on Sunday because of the awful noise of illegal construction at a neighboring development. 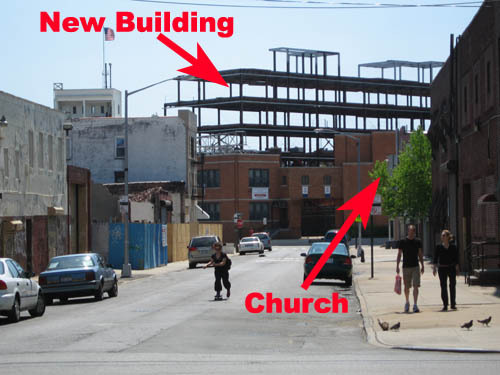 The church is at the epicenter of a neighborhood that is changing around it, a stone's throw from all the development on Roebling Street, Karl Fischer Row on Bayard Street and side streets like N. 7th. It's also near a number of other big developments slated to rise on Union Av enue. It is also directly behind a construction site at 525 Union Avenue where building work has been going on on Sundays during church services. The developer has been contacted by the church and promised to stop the work, but it's continued. The Department of Buildings has been contacted, according to GL's source, but (drum roll) hasn't responded. We videotaped the hideous noise around 10:30 one Sunday morning a few weeks ago. You can see it and and listen to it below, as we figure it's worth reposting here for illustrative purposes. Some parishioners have even thought about protesting at the construction site one Sunday instead of going to mass if the booming, clanking, crashing, cutting and hammering don't stop.